GODERICH – Cows. It doesn’t matter if they’re Jerseys or Holsteins. Just cows. It seems those four-legged cud-chewing creatures figure prominently in the imaginations of artists here along the Lake Huron shoreline. Why else would curators of the Huron County Art Show have to strategically arrange the exhibit to separate paintings of cows, relegating one to each wall? They are separated by barns, trees, wildlife and all sorts of other pastoral scenes captured in a variety of media in this 15th annual show, with this year’s theme: Our Creative Countryside. “It was a great pleasure to jury this show and I was very impressed with the high standard that you’ve developed here,” said David Taylor, during the show opening at the Huron County Museum this weekend. 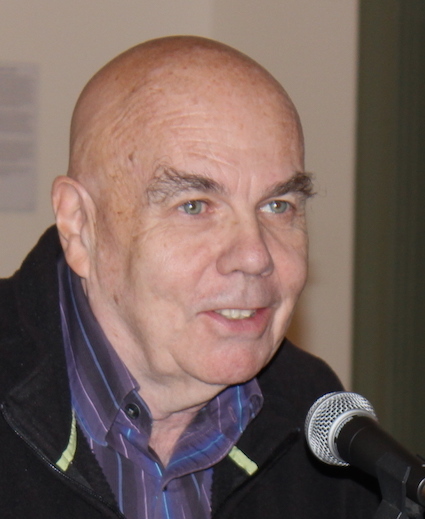 Taylor served as curator of various public art galleries before retiring in 2006 and now volunteers to assist the curator of collections at the Tom Thompson Art Gallery in Owen Sound. In front of a crowd of artists, family and friends, he announced six honourable mentions along with the first and second prize winners, whose artwork is purchased by the County of Huron and becomes part of its art bank for display in county-owned buildings. The exhibit features 36 artists from across Huron County, including 11 new artists. 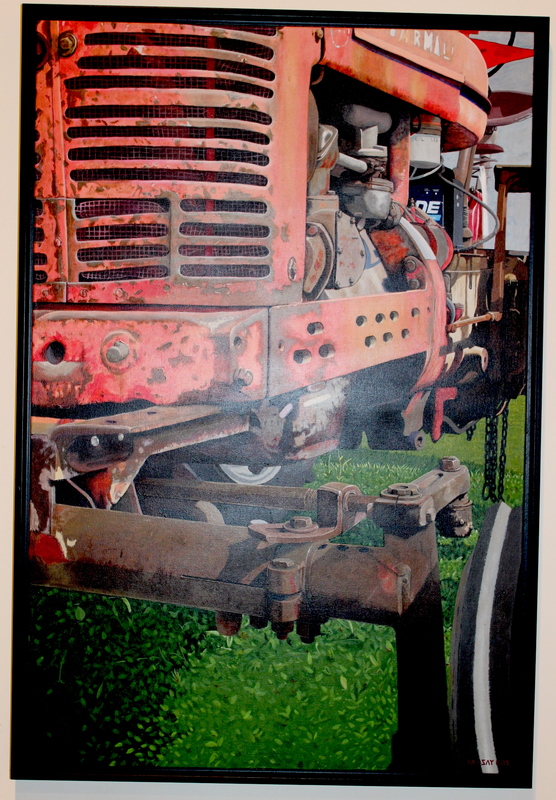 First prize went to Scott Ramsay for Ole Faithful, an acrylic “portrait” of a ’58 Farmall H.
“Each well-earned wrinkle and blemish is creatively reproduced to express the love, use and reuse by the owner,” wrote Ramsay in his description of the artwork. Second prize went to Julie-Anne Lizewski for Field of Promises, an encaustic on wood panel. 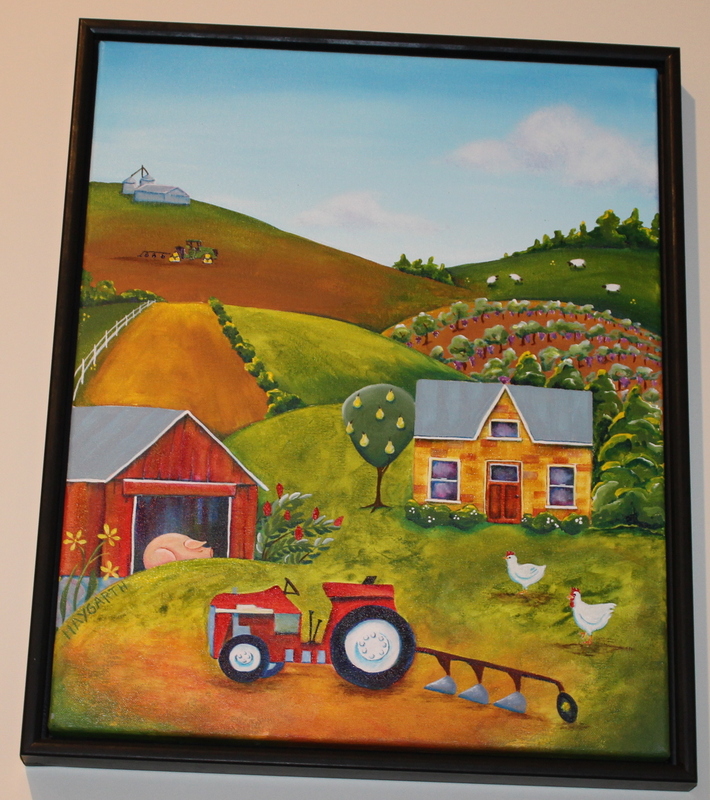 “This painting was inspired by a recent tour of a friend’s Huron County farm, overlooking a field, with a feeling of great joy and hope for the future. The art show is funded by the County of Huron, which recognizes culture as one of the pillars of economic development. “Aristotle once said, the aim of art is to represent not the outward appearance of things, but their inward significance,” said Paul Gowing, the county’s warden, during the opening ceremony. He said the art in the show highlights the inward significance, putting a different light and frame on subjects. Later in the evening, Lynn Haygarth’s liquid acrylic piece, Happy Farm – Plough, was announced as the winner of the People’s Choice Award, based on ballots cast by those attending the opening evening. A final award winner – the one that will make the poster of the 2017 International Plowing Match Rural Expo – will be announced during the summer of 2016. The Huron County Art Show runs until Dec. 20. Entrance is free with museum admission.